The great thing about science is that it causes us to evolve our thinking on topics over time. When we look back at the days of bloodletting as a serious form of medicine, it’s easy to laugh at the simplistic approach to a very complex topic. It probably wasn’t easy to laugh for those who underwent the procedure. We are currently going through a lot of this nowadays. We’re rapidly moving on from the days where your doctor would prescribe a course of antibiotics willy nilly to address something like a virus. Something that won’t be affected in the least by them. But there are a number of “attitudes” that we hold as not only part of medicine but part of society as a whole that we would be much better without. I think nothing represents this more than our care-free attitude towards sleep. Flat out, we take sleep for granted. Surely you’ve heard the old addage, “You can sleep when you’re dead!” Two public figures of the 80s that were strong proponents of this work ’til you drop attitude are Ronald Reagan and Margaret Thatcher, publicly stating that they often sleept less than 5 hours a night. Given what we now know about sleep and the brain, it’s no wonder that both succumbed to Alzheimer’s disease. It’s with this in mind that you may want to take your sleep seriously. And there’s no better place to start than the book Why We Sleep: Unlocking the Power of Sleep and Dreams by Matthew Walker. 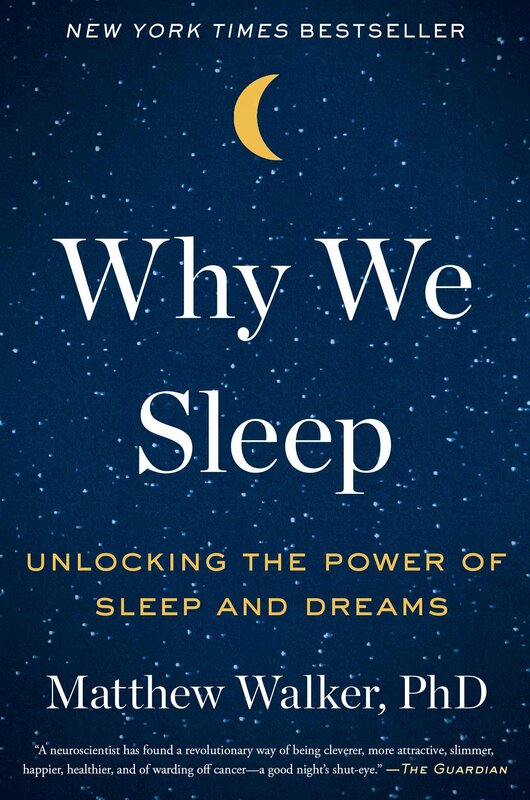 Dr. Walker is a Professor of Neuroscience and psychology at the University of California, and this book is a treasure trove of data on the importance of sleep, the health and financial consequences of poor and inadequate sleep, and methods you can use to improve your sleep. It should come as no surprise to you that our memory fades as we get older. Cognitive decline will absolutely happen no matter what you do. All we can do is slow down or limit the decline. Your reaction time will slow. Your recollection of names and places won’t be what it used to be. It’s perfectly normal to take a little time remembering things. But that doesn’t mean it needs to progress to Alzheimer’s disease or dementia. Along with our cognitive decline comes problems sleeping. Dr. Walker expresses how interdependent these factors are: 60% of the decline in memory that comes with age can be attributed to poor sleep. Not only that, he also tells us why poor sleep can lead to Alzheimer’s. It all comes down to what sleep does for out memory. Sleep can be broken up in to stages based on brain activity during each stage of sleep. Two of the most important stages of sleep for out memory are rapid eye movement(REM) sleep and non-rapid eye movement(NREM) or deep sleep. As you could probably guess, these stages are named based on the presence or lack of rapid eye movement during the stage. During the day we accumulate experiences that we put in to our short-term memory. But short-term memory is just a temporary storage depot, we need to take those experiences and send them in to long term memory. This is important for 2 reasons. First, putting things in to long term memory is important so that we have access to that information later on down the road. Second, and equally as important, we need to free up space in short-term memory so that we can put new knowledge and experiences in there as they come along. During NREM sleep, we move information from short-term in the hippocampus in to long term memory. This is great, it frees up space in short-term memory for the next day for new experiences and allows us to have access to past knowledge in the future. But we’re not done yet. During REM sleep, things begin to heat up. We now take this new knowledge and compare it to our total catalog of past experiences and knowledge. This allows us to make connections between things we’ve learned in the past and this new knowledge. Plus, another rather extraordinary thing happens: The area of our brain dedicated to rational thought goes offline. This allows us make seemingly unrelated connections that consolidate our knowledge base. Dr. Walker does a great job of using many examples to show just how this works and why it’s so important. He also covers what your sleep should look like. What time of night should you be getting NREM sleep? Which part of the night should you be getting REM sleep. With the large number of wearables coming out allowing you to measure your sleep, this is a gamechanger. So what about Alzheimer’s? There’s little chance that improving sleep will be the sole therapeutic approach that people will address to prevent Alzheimer’s disease. But by simply making the pointing that Alzheimer’s plaques are found in the area where memories are transferred from short-term memory in to long term and not in the hippocampus, Dr. Walker makes the case that it’s a variable that absolutely needs to be addressed. The data indicates that addressing sleep can at least delay it for 10 years. I’ve played a lot of sports, learned a lot of different movements, and trained a lot of athletes in my time. Dr. Walker also covers how sleep affects motor learning and skill acquisition. Very similar to processing knowledge, but the motor skills are transferred to a more automatic area of the brain so that they can be performed, eventually, without conscious thought. The motor skill automation process occurs at a very specific time of night, more accurately morning, during the last 2 hours of sleep. This makes an athlete, dancer, or other performer’s last couple of hours of sleep critically important to skill development. This makes the mantra, “Late to bed, early to rise” particularly destructive for these people. This brings us to an important question…Why are we forcing our children in to these unhealthy sleeping patterns right when they are soaking up so much knowledge and so many important motor skills? Of course, I’m talking about school start times. Dr. Walker also repeatedly makes the point about how bad early school times are for children in their teens. They’re simply not biologically wired to be awake at 6am, which is when many children who start school between 7:00-7:30 need to be up. He notes several studies where standardized testing scores are dramatically improved when schools move their start time until 8:30. One school saw the average SAT score improve by over 200 points. Memory isn’t the only thing we need to be concerned about with poor sleep, especially in children. Based on surveys and medical records, it’s estimated that 50% of children with a diagnosis of ADHD actually have a sleep problem. When these problems are due to obstructed breathing, correcting the breathing problem corrects the ADHD problem. Poor sleep is likely a huge driver of the abnormal microbiome in children with ADHD, so it would be interesting to see how it changes in these children who correct the sleep problem. Note: A more recent review on the topic indicates that 75% of people with ADHD have a circadian sleep problem. I’ll be covering this review in a future blog. This connection between poor sleep and ADHD isn’t surprising when you look at what would be happening if a child was allowed to sleep rather than being forced to go to school during a biologically inappropriate time. This is the time they’re supposed to be soaking up uber-important REM sleep. Less than 25% of children aged 11-18 get the necessary amount of sleep. It’s as if we’re setting them up for failure. Good sleep hygiene is important for good sleep, that’s a fact. But I’d venture a guess that most people have no idea what good sleep hygiene even is. In the appendix of the book, Dr. Walker has 12 tips for good sleep hygiene. Having worked with people to get their sleep right, I’ve yet to meet anyone who even has 2 of these down. But people don’t think that these types of things matter, even though most of his tips address factors that our body uses to directly regulate sleep. So they opt for drugs instead. Based off his experience and the data, this can be a fatal mistake. Dr. Walker points out that what we get from pharmaceuticals such as Ambien isn’t actually sleep, it’s sedation. This is easy enough to confirm, we know what brain waves look like during the different sleep stages, and these drugs don’t allow us to get the requisite amount of REM sleep. That isn’t to say that they aren’t useful for someone who’s getting no sleep, but if you can get to sleep on your own by improving sleep hygiene, that’s obviously preferable. But according to Dr. Walker, there is a dark side to these drugs. People who take them are more likely to die early and contract cancer than people who don’t. In a study that followed people for 2 1/2 years, people who took as little as 18 sleeping pill doses PER YEAR, were 3.6x more likely to die during that 2 1/2 period than people who took none. For more frequent users, that number shoots up to 5.3x. And this holding all other factors constant. I don’t think this data indicates that these drugs are necessarily bad so much as it illustrates how important true sleep is. So take that message and begin addressing your sleep now. One part of this book really hit home for me because it covers something that I personally experienced. When my son was born, he was in the neonatal intensive care unit at Virtua Voorhees hospital. This hospital was 45 minutes from our house but we had friends who had children there and it is a top of the line hospital. Fortunately our son was out of the NICU in less than a week and he’s perfectly healthy. I stayed in the hospital the whole time he was there and brought breastmilk to the nurses from my wife’s room so he could have some grub. The room was 100% dark all throughout the night and only had very dim light on during the day. The hallways were well-lit, but each child was in their own little curtained cubby and this cubby had little to no light. In Why We Sleep, Dr. Walker discusses how some cutting edge hospitals are using light as a way to promote better recovery from stroke, traumatic brain injury, and children in the NICU. For neonates, sleep is very important and the more sleep they get the better their outcomes tend to be. While not published data, preliminary evidence indicates that hospitals that operate under these same conditions, with blackout conditions at night and very dim light during the day, have much better outcomes than those that don’t. Not only do the children have better vital numbers when they’re there, they get discharged from the hospital a full 5 weeks earlier than children in hospitals that don’t operate under these conditions. The proper conditions can also improve outcomes for numerous other issues including the side effects of cancer treatment. Proper sleep, which requires the proper conditions, has a transformative effect on the way the entire body functions, sick or not. Obviously the approach is different with an 80 year old stroke victim than it is with a 3 day old baby. Dr. Walker has a way of discussing the science that truly draws you in to the discussion. Why We Sleep is a fantastic book that gives you the true depth of the sleep problem in modern society. There’s so much people can do to advocate for their own health and sleep is right at the top of the list. I can tell you that once I got a thorough grasp of the data thanks to Dr. Walker’s book, I decided I was going to work harder on it. One very important point he makes is that people often have no idea they have a sleep problem. I feel fine, they reckon. But we are adaptable creatures, and once we’ve adjusted to poor sleep this feels like the new normal. Just like the drunk guy at the bar who think he’s perfectly fine to drive, people often fell they get more than enough. While people subjectively feel fine, according to Dr. Walker they’re not based on any objective measure. Luckily, it’s becoming easier and easier to measure your sleep at home without having to go to a sleep ward or strap yourself up with electrodes. There are a number of wearables out on the market that you can use to measure sleep. I chose the Fitbit Charge 2 HR and can tell you that it seems pretty accurate. Fitbit went through the trouble of validating the Charge HR with industry standard devices in studies you can find here and here. That, coupled with the fact that they likely improved the algorithm in the Charge 2 and the Apple Watch app isn’t that useful gives me a reasonable level of confidence that I’m doing the best I can to optimize my sleep. Why We Sleep gave me some very useful tools to improve my sleep. Based on the data it shared on poor sleep and health outcomes, the most valuable tool it gave me was the motivation to do something about it.